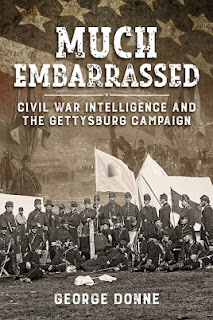 Much Embarrassed: American Civil War Intelligence and the Gettysburg Campaign, George Donne, Helion and Company, 172 pages, 4 maps, 50 b/w illustrations, 3 color illustrations, $49.95. From the Publisher: Before the first shots were fired at Gettysburg - for many, the most significant engagement of the American Civil War - a private battle had been raging for weeks. As the Confederate Army marched into Union territory, the Federal Forces desperately sought to hunt them down before they struck at any of the great cities of the North. Whoever could secure accurate information on their opponent would have a decisive advantage once the fighting started. When the two armies finally met on the morning of 1 July 1863 their understanding of the prevailing situation could not have been more different. While the Rebel Third Corps was expecting to brush away a group of local militia guarding the town, the Federal I Corps was preparing itself for a major battle. For three brutal days, the Rebel Army smashed at the Union troops, without success. The illustrious Confederate General Robert E. Lee would lose a third of his army and the tide of the rebellion would begin its retreat. Robert Lee himself would begin the argument on the contribution of military intelligence to his defeat by seeking to blame his cavalry. Generations of historians would debate into what factors played a decisive role, but no one has sought to explore the root of how the most able General of his era could have left himself so vulnerable at the climax of such a vital operation. Much Embarrassed investigates how the Confederate and Union military intelligence systems had been sculpted by the preceding events of the war and how this led to the final outcome of the Gettysburg Campaign. While the success of the Confederate strategy nurtured a fundamental flaw in their appreciation of intelligence, recurrent defeat led the Federal Army to develop one of the most advanced intelligence structures in history. Lee was right to highlight the importance of military intelligence to his failure at Gettysburg, but he would never appreciate that the seeds of his defeat had been sown long before. George Donne was born in Guildford, Surrey and was educated at the Royal Grammar School before completing a Batchelor of Arts in Classics at the University of Durham. CWL: Much Embarrassed is from a UK publisher. Helion & Company has it ready to ship from the UK. Casemate Publishing, a US distributor of Helion & Company books states that copies will ship in November. Amazon.com lists a December release date. A Savage War: A Military History of the Civil War, Williamson Murray and Wayne Wei-siang Hsieh Princeton University Press; 616 pages; maps, $35. Brief: Combines scholarly and military perspectives in a study that emphasizes the distinct martial cultures of North and South, and the conflict's role in the rise of modern warfare. The Civil War represented a momentous change in the character of war. It combined the projection of military might across a continent on a scale never before seen with an unprecedented mass mobilization of peoples. Yet despite the revolutionizing aspects of the Civil War, its leaders faced the same uncertainties and vagaries of chance that have vexed combatants since the days of Thucydides and the Peloponnesian War. A Savage War sheds critical new light on this defining chapter in military history. In a masterful narrative that propels readers from the first shots fired at Fort Sumter to the surrender of Robert E. Lee’s army at Appomattox, Williamson Murray and Wayne Wei-siang Hsieh bring every aspect of the battlefield vividly to life. They show how this new way of waging war was made possible by the powerful historical forces unleashed by the Industrial Revolution and the French Revolution, yet how the war was far from being simply a story of the triumph of superior machines. Despite the Union’s material superiority, a Union victory remained in doubt for most of the war. Murray and Hsieh paint indelible portraits of Abraham Lincoln, Ulysses S. Grant, William Tecumseh Sherman, and other major figures whose leadership, judgment, and personal character played such decisive roles in the fate of a nation. They also examine how the Army of the Potomac, the Army of Northern Virginia, and the other major armies developed entirely different cultures that influenced the war’s outcome. A military history of breathtaking sweep and scope, A Savage War reveals how the Civil War ushered in the age of modern warfare. Williamson Murray is professor emeritus of history at Ohio State University. His many books include The Iran-Iraq War. Wayne Wei-siang Hsieh is associate professor of history at the United States Naval Academy. He is the author of West Pointers and the Civil War. They both live in Fairfax, Virginia.